The map shows the route under study on the southern end of the project and the two primary routes being studied further for the north part of the line. Here’s the project home page. Looking south along Crenshaw Boulevard. Just below center frame the Crenshaw/LAX Line’s underground section ends with the tracks heading south to Park Mesa Heights. Check out the video of restoration work on Crenshaw Boulevard here. 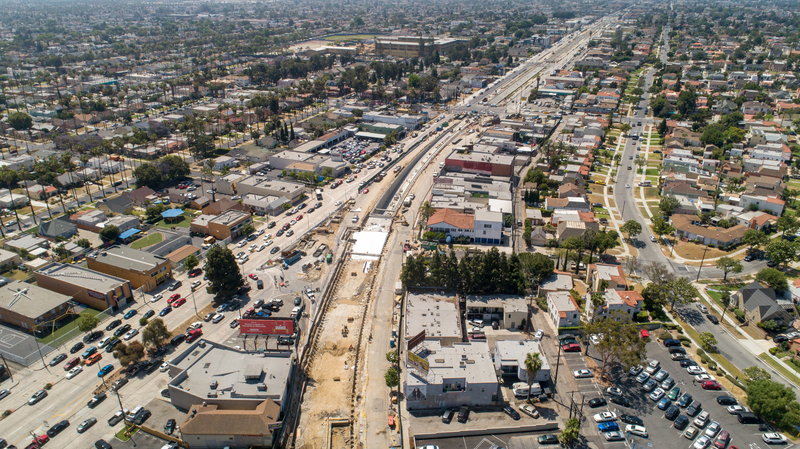 As the story notes, the San Fernando Valley has waited a long time for its own rail line — which will run down the middle of Van Nuys Boulevard and along San Fernando Road. The southern end of this line will be the Orange Line station in Van Nuys. A separate project, the Sepulveda Transit Corridor, will build a rail line between the Orange Line and the Westside (and eventually all the way to LAX). Running a train line at street level “can be a challenge to operate reliably in real-world traffic conditions,” Metro director Jacquelyn Dupont-Walker said during a meeting last week. She questioned whether Metro’s trains would be forced to wait at traffic lights, as they do along portions of the Expo and Blue lines. The city of Los Angeles controls the traffic lights along the majority of the Van Nuys route, and will decide whether trains will be forced to wait at red lights with passenger vehicles and trucks, said Metro transportation planning manager Walt Davis. “Behind the scenes, we’re hopeful that we can secure greater signal priority” than on previous projects, he said. 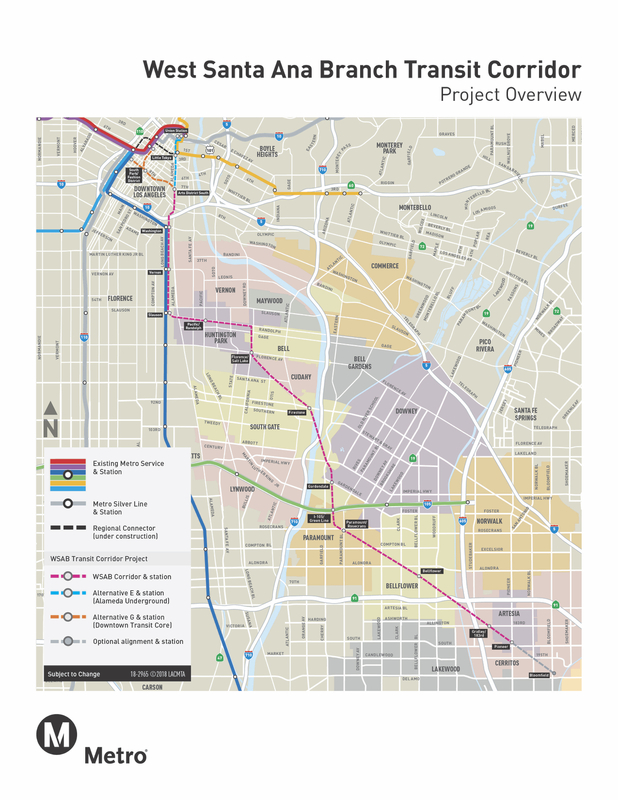 The Metro Board approved a $410-million contract with Tutor Perini Corp. and Frontier-Kemper to dig the tunnels for the third phase of the Purple Line Extension from Century City to the Westwood/Va Hospital, with a station also at Wilshire/Westwood. In testimony before the Metro Board at yesterday’s meeting, Tutor Perini Chairman and CEO Ron Tutor defended his firm’s work on other non-Metro projects. A bill that would return land from the state to Alhambra and Pasadena that was set aside for an extension of the 710 went belly up. Sounds like legislators weren’t on the same page, although a surface 710 extension died back in Days of Yore. It’s a big chunk of land in both places. Alhambra is considering a park. The bill could resurface next year. The cost will be up to $7 million and will give students annual passes to ride buses and light rail. I don’t believe too many cities do something similar — more often students are offered deeply discounted passes. Metro, for example, offers K-12 students a $24 30-day pass, which normally costs $100. Things to read whilst transiting: summer reading guide in the NYT. Nice. Huge win for the valley. I hope we can build the line as separate from the grid as possible. Doing so completely will more than likely be to expensive but doing so at the busiest intersections may be feasible. Looking forward to see how this study plays out. Keep the land. Complete the 710!!! Of course Metro is going to build this line at street level, with multiple at-grade crossings. All they care about is saving money, not (a) savings lives (Blue Line has the most fatalities) or (b) encouraging increased ridership by build a rail that actually saves time rather than one where trips take longer than driving.